I've never been a big believer in facials. I've gone 30+ years without them, and my skin's none the worse for it. Nobody except a licensed dermatologist has treated my skin in my entire life until recently, because I'd much rather treat the underlying problems and know for sure that what I'm putting on my skin or ingesting orally is medical grade. Maybe it's a negative stereotype but I've always got this impression of facial salons where they're putting all kinds of strange masks and treatments on your face, and having non-medically trained personnel use unscientific procedures and techniques on your skin. But the newer generation of facials uses high-tech equipment and borders aesthetics treatments, so I was quite curious to try the new MAGIC DROPS Micro-Dermal Infusion With Ultra Lift, so I popped into Nu. Reflections for a trial session just to see what it did and whether my skin liked it. Like micro-dermabrasion, which removes top layers of your skin and can result in some redness and soreness, micro-dermal infusion is quite gentle and generally less likely to leave any redness, which means you can go right back to work or go out without any problems. It also has the added function of infusing the skin with liquid serums customized for your skin concerns, before all the debris that gets exfoliated or loosened is removed using vacuum suction. Visibly reduce surface fine lines & wrinkles. Improve acne-prone skin; less oily, less breakouts. Refine pores, skin tone & skin texture. Brighten and hydrate skin; improve suppleness & elasticity of skin. I have somewhat-sensitive normal to dry skin that is quite prone to redness if I use any harsh exfoliating devices on it. Grainy scrubs and Clarisonic brushes cause me to breakout, so I was actually pretty worried that I would react badly to this as well. But surprisingly it felt alright. If you feel any discomfort, you can always tell your therapist and they can lighten the pressure on your skin, but it really didn't hurt at all for me. You will feel the abrasive tip pass over your skin in short strokes, and that's about it. Depending on your skin-type and whether you have combination skin, the facialist could use one, two, or a mixture of solutions for different skin areas. During my session, the blue solution for dry and sensitive skin was used all over, and then a second pass was made using the pink serum for brightening. The machine has an additional Ultra Lift function as well. Because absorption is optimal after exfoliation, they've designed the device to also include an ultrasonic metal pad which can be used after the dermabrasion procedure. 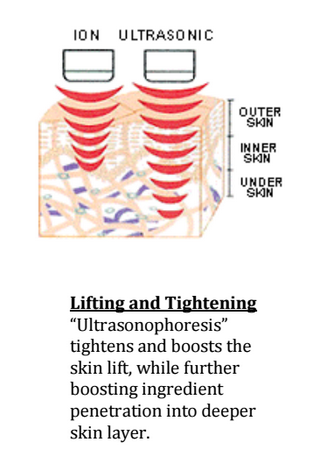 This technology is called ultrasonophoresis, which increases the penetration rate and depth of skincare ingredients into the skin, and also improves circulation. This is an optional step to the facial, and better for those who want an extra skin plumping and lifting treatment. During this phase of the treatment, a skincare lotion or serum is massaged into your skin and then the metal ultrasonic tip is applied to your face and slowly massaged in circular motions, you can feel little prickling sensations like static electricity on the skin. But again, it is nothing much to worry about. I was actually quite thrilled that I could feel it working. After the treatment, my skin felt so smooth and well-hydrated. There was zero redness and I didn't react badly either, which is a good thing. Visibly reduce surface fine lines & wrinkles - I can't really say too much about this as I'm not testing it as an anti-aging treatment and I don't have very visible lines to treat currently. Improve acne-prone skin; less oily, less breakouts - any proper exfoliation treatment helps to reduce chance of clogs, but do note that you should be extra gentle with your skin for a few days after this type of procedure, especially if you are sensitive or prone to getting spots from using strong skincare and tools like me. Your skin is thinner and might be more reactive to strong stimulation. Refine pores, skin tone & skin texture - definitely a big yes; the combination of exfoliation, infusion, and vacuum extraction, followed by ultrasonic treatment really made my skin feel ultra-soft, toned and smooth. Brighten and hydrate skin; improve suppleness & elasticity of skin - exfoliation removes the top layers of dead skin which can sometimes inhibit skincare absorption, so besides infusing your skin with hydration and other skin repair ingredients on the day of treatment, this definitely helps your own skin products to work better for awhile after, but you will need follow-up treatments for the beneficial effects to continue. Lighten and diminish hyper-pigmentation (melasma / brown spots / acne scars) - again, exfoliation gets rid of the top layers of your skin, which is usually also the dullest and most discolored layers. So you definitely get an instant "brightening" effect. But discolorations go quite deep into your skin layers, so you will need a few more sessions to gradually remove existing acne marks etc. In the end, dermal exfoliation works only the top layers of the skin, so you should be prepared for repeat sessions for the best results. If budget is a problem, then this is not the best option for you just for skin maintenance. If however, you are looking around for a quick boost before a big day, especially if you're having a wedding and want to minimize breakouts and clogs before the date comes around, or to ensure you look especially radiant, this is definitely one thing you can consider checking out. Do NOT go for a completely new facial treatment just before a big day, if you have never tried it before. At least book one trial session ahead of time, just to see how your skin likes it. If skin maintenance is a big thing for you and you're willing and able to go for exfoliation treatments regularly, then judging by the usual frequency recommendations for micro-dermabrasion, you can consider scheduling monthly sessions for MAGIC DROPS. 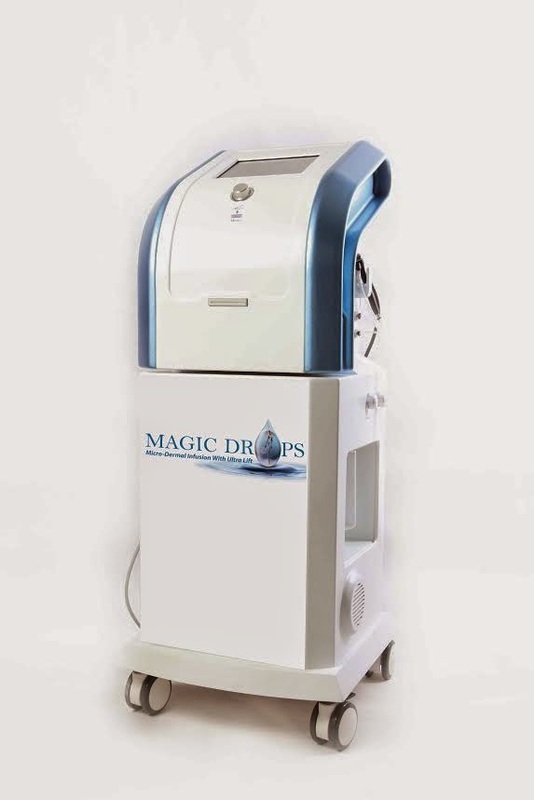 MAGIC DROPS Micro-Dermal Infusion is currently priced at $300 per session at Nu.Reflections, and the Ultra Lift treatment is an additional $50. There is no package price currently available but the clinic has kindly offered Makeup Box readers 50% off trial price for all therapist facial and slimming treatments. If you're curious to try any face or body treatments they offer, but not sure about committing full-price yet, this is a perfect chance to check them out. Just quote my name "Candice" or "Makeup Box" when making enquiries at (65) 6235 0555. Disclaimer: My MAGIC DROPS session was offered for review purposes, but this is not a paid advertorial; all opinions are my own.